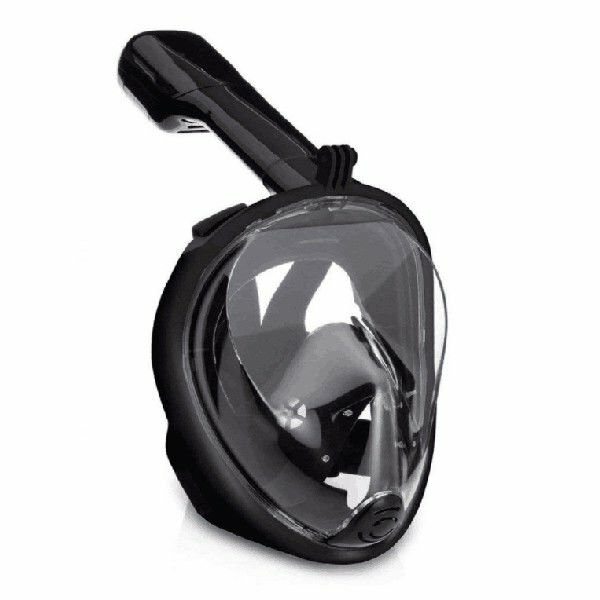 【180° View Full Face Design】Full face snorkel mask and ultra wide shockproof view ensure you a safe 180° underwater view of various fishes and other sea creatures. 【Comfortable Wearing】Inner medical silicon material provides you a soft and tight fit to your face with no odor. The rubber earplugs accessory prevent water from entering your ears when snorkeling. 【Water Proof Design】When the breathing tube is submerged in water, the floating ball will float up and block the inhaling tube to prevent water from entering; when the breathing tube rise above the water, the floating ball will fall and open the inhaling air way so that you can breath freely. 【Action Camera Mount】 With this design, you can record those memorable moments while enjoy snorkeling. ★ Anti-fog -- Separate breathing chamber design effectively stops the mask from fogging up by a dual air flow system, Enjoy a crystal-clear viewing experience. ★ 180° Panoramic -- Snorkel mask provides you a breakage-proof safety window with 180° wide viewing give you a full view scenery under the sea. ★ Full-face -- Snorkeling mask takes away the inconvenience of holding the snorkel in your mouth, allowing you to breathe naturally through your nose and mouth underwater.